Billie Virginia (Hallmark) Shasteen, age 90, died on June 7, 2018. Billie was born on March 19, 1928 in Kingston, Oklahoma to William Whitmore Hallmark and Sarah Elizabeth (Suther) Hallmark. Billie spent her life serving her family as a homemaker. Billie had a love for gospel music, especially Elvis Presley, and the Blackwood Brothers. 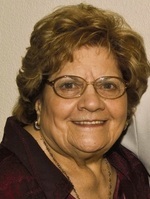 She was a loyal fan of the Texas Rangers, Dallas Mavericks, Dallas Cowboys and the Dallas Stars. Billie loved her time spent at Oak View Baptist Church and Hilltop Drive Baptist Church. In her later years she loved going to family reunions and family get togethers, where she was known for the best chocolate biscuits in the world, rum cake and chocolate sheath cake. Billie is preceded in death by her parents; husband Clifton M. Shasteen; sisters Ellen Middleton, Anna Laura Clark; brother Roger Hallmark; and niece Anna Tynice Hallmark. Left to cherish her memory are her children Debra Virginia (Shasteen) McLaughlin and husband Rick, and Van Clifton Shasteen and wife Rhonda; grandchildren Matthew Shasteen and wife Petra and Vanessa Shasteen; great grandchild Clementine; brother J.W. Hallmark and wife Ellen and Mendal Hallmark and wife Barbara; caretakers Bibi, Maria, Priscilla and great niece Whitney; as well as many loving nieces, nephews, friends, and extended family. The family will receive friends on Friday, June 8, 2018 from 6:00 – 8:00 PM at Brown’s Memorial Funeral Home, 707 North MacArthur Blvd., Irving, Texas. A funeral service will be held at 2:00 PM on Saturday, June 9, 2018 at the funeral home with graveside services at 3:20 PM at Oak Grove Memorial Gardens, 1413 E. Irving Blvd., Irving, Texas. The family requests memorial donations to Lottie Moon by going to https://www.imb.org/who-was-lottie-moon and clicking on give; Oak View Baptist Church by going to http://ovbc.net/ and clicking give; and St Jude Hospital by going to https://www.stjude.org/ and clicking donate; and Scottish Rite Hospital by going to https://scottishritehospital.org/ and clicking donate. To send flowers to the family of Billie Virginia Shasteen (Hallmark), please visit our Heartfelt Sympathies Store.